From a visual point of view, Gotterdammerung – the last segment of Wagner’s Ring, revived for the final time in Keith Warner’s staging – is the least consistent, with too many of late set designer Stefanos Lazaridis’s ideas either obscure or undistinguished. Musically, however, the concluding evening is as good as any in the cycle, and spectacularly so in the cases of the two leading singers: Nina Stemme’s Brunnhilde and Stefan Vinke’s Siegfried. It is something of a truism that Wagner makes impossible demands on his singers – as well as his other creative participants, not to mention his audiences — in his four-day, sixteen-hours-long epic: in Twilight of the Gods, Brunnhilde and Siegfried in particular have to go on delivering the vocal goods for hour after hour. Leaving aside all the other levels on which they have to succeed, purely in terms of staying power Stemme and Vinke are astonishing in their stamina. As punishing phrase succeeds punishing phrase, one is in awe of their sheer vocal fortitude. Both also deliver dramatic performances of quality, with Vinke assigned the difficult task of conveying a heroic character who never really understands what is going on around him, and managing to make him real. The evening’s dramatic honours, though, are shared with Stephen Milling’s sonorously villainous Hagen, Emily Magee’s impassioned Gutrune, and Karen Cargill’s powerfully engaged Waltraute. Markus Butter is a slightly tentative Gunther, while as Alberich Johannes Martin Kranzle’s potentially riveting scene with his son is compromised by its visual presentation; but the trios of Norns and Rhinedaughters are both distinguished. 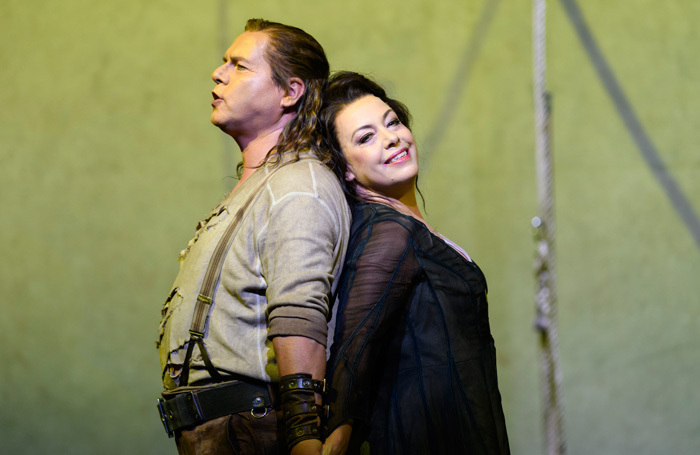 As heroic in their way as Siegfried himself are the musicians of the Royal Opera House Orchestra, who maintain exceptional standards under the motivating baton of Antonio Pappano, while in their intermittent appearances, the company’s chorus is equally impressive.